The rich illustrations evokes a magical night world in this book, and, accompanied by rhythmic verse has become a bedtime must-read over the last few weeks in our house. when I took the Moon for a walk." Each verse ends with the same eight words very reliably and reassuringly that after the third read, when I pause at the right place, Ana completes the verse gleefully. And, Alison Jay, the illustrator, cleverly hides a few details not mentioned in the verse which promptly becomes a treasure hunt once we hit upon it. For instance, during the above verse, the moon loses a red shoe presumably hitting against the church spire, which the boy then recovers in a subsequent page. caught me by surprise and didn't take long to grow on me (and Ana) so much so that I have had to request an extension so we don't have to return it to the library yet. 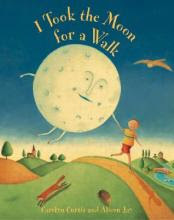 With 4-6 year olds, this book can lead into basic introduction to Nature, Science, Celestial Night Sky, and the more physical realities with the Moon Facts listed at the end of the book, while still preserving the imaginative and magical world personifying the moon through the motley illustrations that project the ethereal story of sorts. For 2-4 year olds, where Ana falls, the illustrations are brilliant, and the verses are mellifluous and soothing. The illustrations tightly couple with the verse which make it easy for toddlers to follow along and improve their vocabulary: "Hand holding hand" shows the moon holding the boy's hand and willingly exploring... and it struck me that not too long ago was a full moon while Ana and I were driving home when she spotted it and joyfully noted that the moon is coming with us... until I had to make a turn and we missed the moon which made her wonder where did the moon go? Bottom Line: Wonderful illustrations coupled with fluid and harmonic verse makes this a 4 bindi book for me. the cover of the book looks very nice - I am greatly attracted to the illustration..
alison jay's illustration looks great.. a quick search on google gives some interesting pictures by her..
oh! K does exactly what Ana did few months ago - he looks for the moon everywhere (Actually he's been at this 'phase' for abt 6m now!) he'll love this book, I am sure. the front cover is original and attractive. We are in the "moon phase" with S the last few weeks..She would love this one. Thanks, Sheela! The other moon books we are reading to S are - Look, the Moon that Kodi's mom recommended as well. (Thank you KM! ) And Papa please get the moon for me by Eric Carle. Ok - that's a lot of moon talk. Bye, and hope you all had a nice weekend! I can't help but commenting on these beuatiful reviews. and I may be sounding repetative but I feel so happy to see the reviews of the books that my daughter loves and also, some reviews of the books which we don't have read yet. That gives us an opportunity to read more. This particular book also talks about all the moon shapes like full moon, new moon, gibbous moon, half moon etc and nocturnal creatures at the end. I think that has given new insight to my daughter.